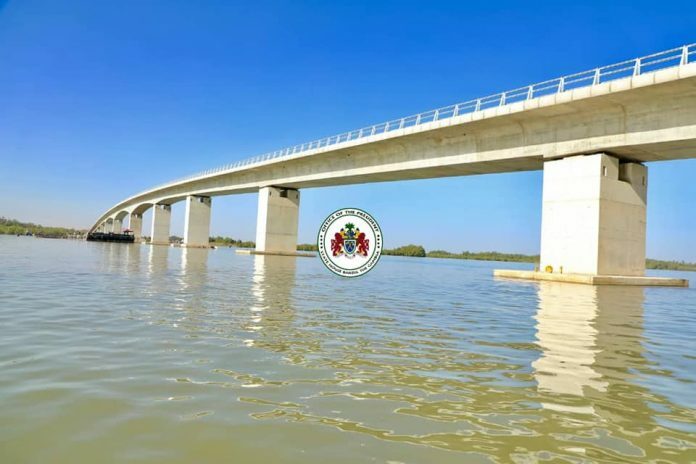 The President of the Republic of the Gambia Adama Barrow alongside his counterpart Macky Sall, president of the Republic of Senegal, on Monday preside over the inauguration of the Trans-Gambia Bridge, Office of the President announced. President Barrow received President Sall at Farafenni in the North Bank Region where they both headed to the inauguration grounds. The bridge is one of the biggest in the sub-region with a length of 1.9 kilometres and over five storeys high. It is designed to be a tolled-bridge that would accommodate the passage of most vessels, while longer-mast boats can easily fold their masts to pass under the bridge. Fifty seven percent of workers where Gambians, eighteen per cent expatriates, and twenty per cent other ECOWAS citizens. The whole project was funded through a grant from the African Development Bank (ADB) in an amount of 65million AfDB units of account (approx. to GMD 4.5 billion). Of this sum, the bridges would eventually cost approximately 3.8 billion Gambia dalasis. The bridge, which is part of the Trans-Gambian Road Corridor, is a vital economic and strategic link connecting north and south banks of the River Gambia as well as The Gambia, and Senegal .